GOT QUESTIONS? WRITE US A MESSAGE AND WE WILL CONTACT YOU! Since the company has been emerged one of its strongest aspects has been design and engineering department. Lots of investments and efforts which we have put without any doubts allowed us to achieve success. Over time, our design department has been widely developed and now each of our product is being created and cared by dedicated group of experienced designers. Intralogistic projects we realise always have a significant impact on the one's production plant material handling processes. We offer comprehensive assistance in optimisation of internal material handling, through the preparation of unique design suited to the production profile, characteristics of the plant and individual needs. Customized solutions are the best choice for our customers , as they allow to remove or reduce the disadvantages of standardised systems . "Standard " logistics solutions are often not in fact appropriate to the nature of the plant as they do not take into account individual some special needs. 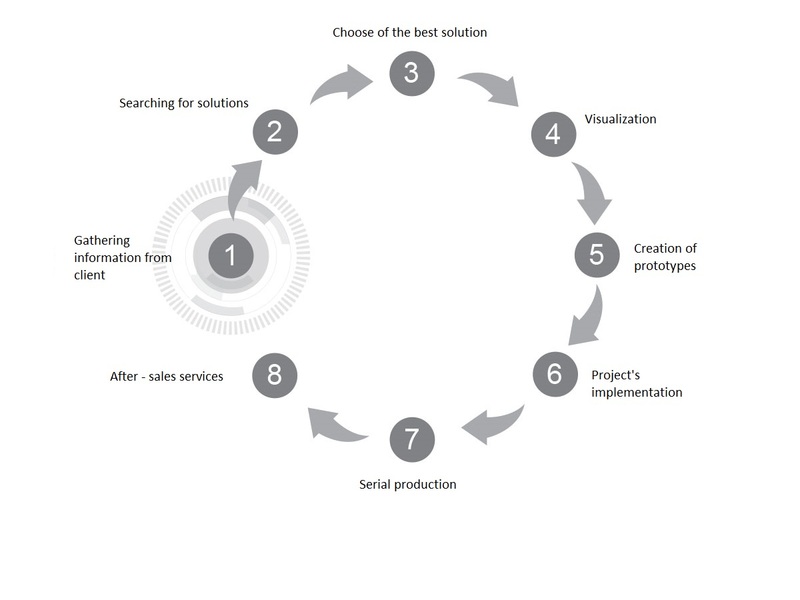 Intralogistic projects realisation consists of different phases and the way which allows to reach the most optimal solution is illustrated by the following diagram. Cooperation between the design and prototyping departments provides customer satisfaction guarantee and makes sure that the provided product meets all the expectations.